If you are having the same problem, then do what the Original poster did. to fix it. If you are having a different problem with similar symptoms, then start a different topic. please stop posting your problem onto other peoples' different topics. You have a quite different problem, so your posts have been shifted here to your own topic. Now please tell me Do you have some other Roxio software with video capture capability installed on your machine? Property(S): IS_PREVENT_DOWNGRADE_EXIT = A newer version of this application is already installed on this computer. If you wish to install this version, please uninstall the newer version first. Click OK to exit the wizard. It's definitely the install of the Roxio VHS Capture Driver where the failure is happening, and if I'm interpreting the log right I think it is because it has found a newer version of the driver. If that's so, you may have to locate and uninstall/rename/remove/kill the newer driver, and then try the install again. Something else you may want to know - NXT 3 is limited in the number of installs you can do with your product key. If these attempts are being counted against you, you may run out of installs. If that happens you should send a Private Message (PM) to our Root Admin Rox-Ralf who has the Godly Power to re-set your product key. What would be the name of the driver that I would be looking for? Also would it be part of the Video Capture USB? I don't know the name of the driver, but if you have Roxio video capture software installed that's very likely to be what is causing the problem. I suggest you try uninstalling the video capture software, as long as you have the installer disc or files. That should remove the driver. Then try installing NXT 3 once more, and let me know how you get on. I had Roxio Video Capture VHS to DVD but had unistalled it before trying to install NXT 3, Trying to reinstall it then uninstall it I get the same interrupt message .. Try again in a few days....Rox-Ralph is the only one that can help you, sorry. Jarman1, I've sent you a Private Message. Go to the top of this page, and you find a icon that looks like an envelope, and that should have a number in it, indicating you have a message waiting. Click on that please, and respond appropriately. Jarman1 would you check your C:\Windows for a installer folder? This thread explains what you need to do to check, post # 25 first then post # 27. First, throw out System Mechanic Pro ! In the past, it has caused more problems than it has prevented or solved. Registries do not normally need to be protected. Download the trial copy of REVO Uninstaller PRO. You can search for fully or partially installed/uninstalled software. One you find it, uninstall it using the MODERATE mode only. It will find the software dregs and search for registry items and folders. Delete those after looking at them.. This post is similar to yours. Start reading at post #39 and how the OP solved it. Here is the "ODD" situation. in the folder options I have show hidden files, folder, and drives checked. 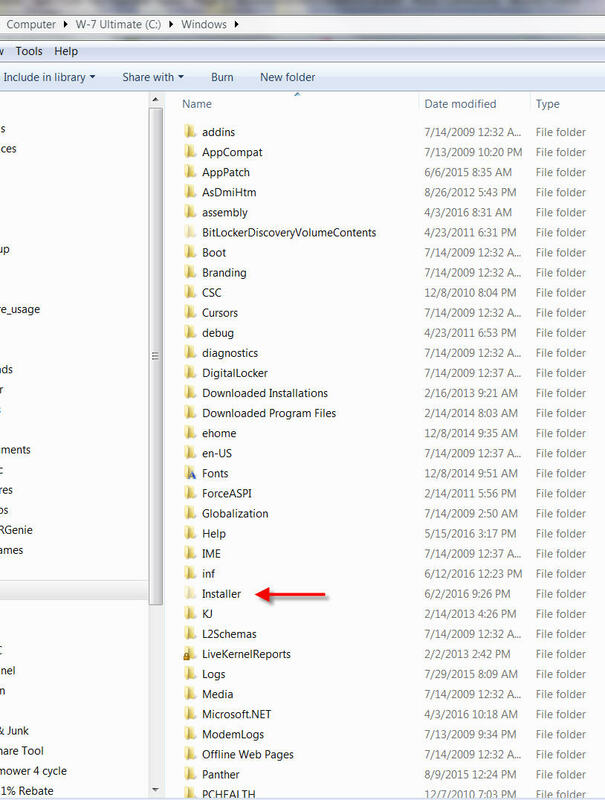 In the windows directory it does not show an Installer folder , so I tired to create a new folder by that name, it asked me if I wanted to replace the current folder, which does not show even with the option to show hidden folders. BTW nothing in the recycle bin to restore. 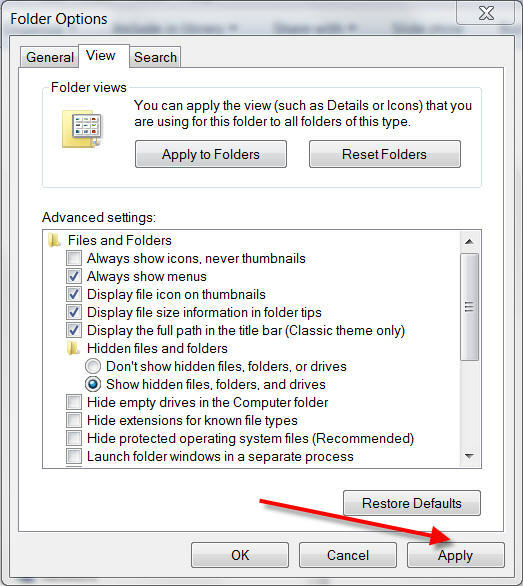 After you clicked the box show hidden files, folder, and drives checked, did you click apply? It's needed 'Installer folder' to install Roxio software.